Four and a half years after first raising the issue about too-early school start times, parents are still looking for change. a Community Task Force comprised of parents, teachers, students, administration, and other interested residents from Northborough and Southborough, with the goal of examining possible options and preparing recommendations to the Combined School Committee. The “Community Support for Safe and Healthy School Start Times in Northborough-Southborough” petition already has at least 250 signatures* and is seeking more. While the The American Academy of Pediatrics has recommended that high schools should start no earlier than 8:30 am, Algonquin’s start time is 7:20 am – among the earliest in the state. Students in the district are boarding buses as early as 6:07 am. Research shows that teens need 8.5 to 9 hours of sleep per night, and early start times deprive them of the sleep they need. . . Earlier bedtimes are not a solution, as teen bodies have a different circadian rhythm that makes it difficult for them to fall asleep early in the evening. Studies have shown that later start times for high schoolers result in better academic performance, fewer car accidents, lower rates of depression and anxiety, lower rates of substance abuse, lower rates of obesity, and fewer sports injuries. You can read (and sign) the full petition here. The petition was started by the Northborough-Southborough Chapter of Start School Later. You check their website out here. Back in September 2014, the Combined School Committees authorized the administration to start a “study group”. Since then, there have been surveys and several updates on the challenges, but no changes have been implemented. Last March, Regional Committee member Kathleen Harragan defended against charges that the administration hadn’t done anything. She said a lot of time had been spent studying the issue. You can read about the combined school committees’ discussion on the issue here. At the time the Superintendent’s office was still looking at what improvements could be made via tightening the bus schedule. The possibility of consolidating stops was mentioned again at the April Regional School Committee Meeting. In late August, I asked Superintendent Johnson if newly consolidated stops on the K-8 bus routes were an effort to help the Algonquin buses start later. The answer was no. She explained that changes were made to fix issues with late pick ups and returns, not due to the sleep issue. I think we are on a good trajectory to really come up with some innovative ideas. According to Harragan, all possibilities were on the table. The update seemed similar to ones made in spring 2015 and since. Start time updates were not on May or June agendas of Regional or Combined school committees last year. Now parents are asking to allow a new “task force” to address the issue. *While I was working on this post, the number of petition signers was growing. When I last checked, before 2:00 pm, it was at 250. Before school started this fall, I posted and asked for an update on the ARHS school starting time. That query was met with a deafening silence. to get an idea of how long the school system has been kicking this can down the road. It looked pretty hopeful (although a 20 minute school start time delay is akin to doing almost nothing) in the March 2018 issue, however nothing was done. As one of the articles notes, the issue was initially raised by the N/S Start School Later chapter back in 2012 – 6 years ago! I have spoken with mental health professionals who have stated they are seeing a large number of students from ARHS for a variety of mental health issues (significantly more than from other area schools). Note the research clearly indicates mental health and academic issues correlated with insufficient sleep. In the 2018-19 school year, the starting time for the high school moved to 8:07 a.m., as compared to its previous start time of 7:23 a.m. The junior high starts at 8 a.m., as compared to their previous start time of 7:30 a.m. All elementary schools in the district start at 8:50 a.m.
Arlington: 8:00 a.m. – 2:26 p.m.
After 3-5 years of planning, in school year 2017-18 the high school moved bell times about 50 minutes later, to 8:20 a.m., and the middle school will start about 25 minutes later, to 8:15 a.m. The high school day now ends at 2:45 p.m., the middle school day at 2:40 p.m. In a change led by the superintendent implemented in the 2018-19 school year, the high school starts at 8:35 a.m. and the middle school kept its start time of 7:35 a.m. Memorial kept its start time of 8:10 a.m. and both Fox Hill and Pine Glen switched from 8:35 a.m. to 8:10 a.m. Francis Wyman started later, moving from 8:10 a.m. to 8:35 a.m. The high school is dismissed at 3:05 p.m. and the middle school at 1:55 p.m. Memorial, Fox Hill and Pine Glen are dismissed at 2:15 p.m. and Francis Wyman at 2:40 p.m.
Concord-Carlisle: moves high school to 8:00a.m. for 2017 academic year. Duxbury: Now 8:20 a.m. – 2:45 p.m.
Hingham: Now 8 a.m. – 2:32 p.m.
Marblehead: Now 7:55 a.m. – 2:30 p.m.
AMSA Charter School starts its first class starts at 8:15 a.m. (homeroom at 8:05 a.m.). Medway: Now 8:04 a.m. – 2:31 p.m.
​Changes implemented in the 2018-19 school year. In 2004 moved high schools from 7:40–2:20 to 8:99-2:35 schedules; middle schools from 7:40–1:55 to 7:50-2:10; and elementary schools from 8:20/9:00–2: 30/3:00 to 8:35–2:35. Superintendent formed advisory committee to study all issues. Change based on concerns about sleep health. 166 in the first two months last year to 19 days in September and October of this year. Superintendent formed advisory committee to collect research, speak to sleep experts and conduct stakeholder meetings. The resulting change in 2011 was a partal success in that is was not as great a delay as recommended. Nonetheless, reported outcomes included improved grades and attendance and decreased tardiness and disciplinary action. High school switched from 7:15–1:57 to 7:40-2:15; middle school from 7:20–2:05 to 7:55-2:20; and elementary school from 8:15–2:50 to 8:35–3:00. Made a 40-minute shift for the start of the 2010-2011 school year. Was 7:25 – 8:00. For last 6+ years has been 8:05 – 2:40. Changes implemented in the 2018-19 school year. Neighboring Ashland and Marlborough seem to have got their acts together – what’s the matter with Northborough/Southborough? And, please, do not offer excuses about the buses, athletic programs, etc. All those are surmountable. Don’t believe it? Talk to your peers in the cities and towns listed above! Why is the leadership of the Northborough/Southborough school system sitting on its hands? You’ve heard from parents and students. Mental health professionals have weighed in on the issue. You’ve observed, first-hand, behavioral issues with your students. What are you waiting for? Anyone ever looking for updates from the school or town should reach out directly to the department or officials. Sometimes it seems that commenters assume that town/school officials are reading the blog comments and will/should respond. Once in a while someone has – but it’s not a reliable way of communicating with them. If you were expecting an update from me – I didn’t have any news to share at that time. You say do not offer excuses and that the issues are surmountable, but you do not state how any of these other communities surmounted them. Seriously, how did they do it? There are costs, some families will get the short end of the stick or we will be paying big to unstagger the bus routes. 700k was thrown around before, that is $230 per household. That may seem like nothing to some to fix this problem but that might be a lot to others who don’t see why the kids can’t just get to bed by 10 like they did. My guess is that the problem is that change requires work and those who would have to do the work (whether it is the administration or school committee or teachers) don’t have an incentive to do it and the risks and costs involved with change may actually provide a disincentive. I also have an inkling that there are teacher union contract issues at play. Some of the teachers might be happy with the status quo and at the end of the day that contract rules everything. Won’t it cost a lot to move school start time later? and increased rates of obesity and associated health complications. As you note, it may be the *teachers* who don’t want to change anything. Curious, since one keeps hearing how the students are the focus of everything that is done by the school system. keeping them sleepy until around 8 am. As pointed out above, many Massachusetts towns have implemented later start times. What do they know that our school system doesn’t? What have they done that our school system doesn’t seem to want to do (since they’ve been kicking the can down the road since, at least, 2012)? No other parents in Northborough/Southborough have students attending ARHS? Maybe you just don’t care? 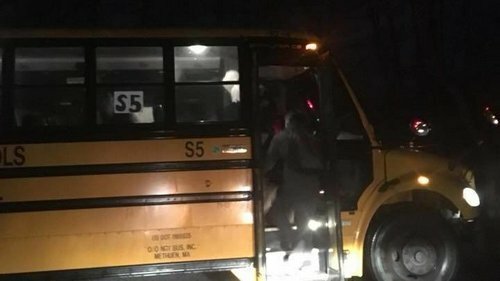 Perhaps these parents are driving their kids to ARHS, allowing them to sleep a bit longer (although still messing with their circadian rhythm), instead of having to take the bus, which would come by earlier? Of course your tax dollars are already *paying* for the bus service, so you’re paying twice – once for the buses and again to drive to ARHS. Not saying I don’t agree with a later start time, but part of our small town issue is delivery of students. We share buses across ARHS as well as all of the Southborough elementary schools, correct? Isn’t this part of our scheduling issue around start time? Southborough does indeed share buses between ARHS and the Southborough elementary schools. This may be a part of the issue around scheduling a new start time at ARHS – or it may not. It may be being used as some sort of excuse for inaction on this issue – again, since 2012. It’s most likely easier to come up with excuses for inaction that it is to work toward an effective solution. Look at the history of the last 6 years for proof. Look at the current proposal to have a ‘new task force’ look at the issue. How many repetitions of studies do we have to go through? Some people really like this idea because it continues to provide a delaying action and no tough decisions have to be made. If the N/S school administration and the ARHS administration *really* cared about the students, as they profess to, there would be no delay in getting the ARHS school start time pushed out to 0800 or 0830. After all. it’s (only) the students mental and physical health and academic success that are at stake. Is there really any question about the correct course of action to be taken? Just FYI, I’m all for pushing the start time back. I agree with you with the question what are we waiting for. I was trying to answer the question so that those who care more than me may make the best efforts to champion for the change. You didn’t really answer any of my questions though. The actual facts on the costs incurred by these other districts will go a long way in providing a platform to stand on. The old we want something, but we’re not really sure what it is or how to get it probably isn’t going to go very far. I agree that the long term societal benefits may out weight the short term costs of the change, but real money is still going to be needed to be spent now to get it done. That money is an obstacle that can’t be ignored, so don’t say it won’t cost more, you should say it is worth it. You also didn’t really address my teachers comment. I’m genuinely presenting that that may be the answer to your question. If it is (and I really have no idea), then this is where the catalyst for change needs to be targeted. You also seem to suggest that the only way to incite this change is by outrage amongst the parents of students at ARHS. This may be true, but then those that want the change need to vote for school committee members who will make it happen. They have all the power, the administration works for them. The parents power is in their vote, election time is when this issue needs to be pressed. To answer North Sider. Yes busing is the main issue. We are either pushing out the Finn/Woodward schedule to a time that many feel is too late or we are collapsing the three tiered bus schedule to two (or some other creative solution) but that will cost money. From the previous conversations about this, the money seemed to be the sticking point. It really boils down to the school committee determining their priorities and apparently for the money they didn’t find this to be worth it. Updated bus routes published today have earliest pick time for Algonquin at 5:57 a.m. and the earliest arrival at Algonquin 6:41. I’m confused by your statement. I’m seeing the earliest pick up time at 6am (only 3 minutes difference though) with earliest school arrival being 6:24am. The 6:24am school arrival is N13, which I find puzzling. Its Melican route shows it leaving Algonquin at 7:12 am. I assume that they build in buffers for traffic, but a 48 minute gap seems extreme. The buses that start with ‘N’ are Northborough buses. I was looking at the ‘S’ buses, Southborough routes. If you are on the district’s website and looking at the bus schedule, there are tabs at the bottom of the page that allow you to choose between Northborough routes and Southborough routes. Crazy that kids will get picked up at 5:50am, stop punishing my child for your stupid-ness Nboro-Sboro school district, we need at least 1 sane person on the board. To get picked up at 5:51, kids need to get up at 4:30 AM. I feel like having my kid do schooling at sboro is a punishment., I will move to another town if it is not changed, trust me I’m not the only parent thinking about moving out of town. I’m feeling that the early start time is not the only punishment for simply attending school at Algonquin. Such over the top rules being implemented that my whole family is feeling stress and anxiety. School should not be like this. Our kids are really great kids. OK, now you made me laugh. While I agree 5:50 is too early for a bus to arrive, it does not take an hour and 20 minutes to get up and out to the bus stop. My kids had it down to 20 minutes. Take a shower the night before and pack up your stuff. In the morning, all you need to do is pull on clothes, grab some food, and head out the door. You can eat breakfast on the bus on the way to school. If you feel so strongly about this, then run for school committee. To @resident, I want to teach my kid some good discipline, hygiene & lifestyle, so his schedule in the morning goes like this. 7) Head out to the bus stop. This is how any student should start a day, they should feel less stressful & fresh before they go to school. Take a bath? Do yoga? Even if the bus came at 7 am, doing all of this before school is not realistic. Concerned parents, please bring up the madness of 5:50 AM school bus in local and national news channels.